Synonymous with luxury, elegance and great service since 1892, The Brown Palace Hotel and Spa in Denver epitomizes the height of opulence in the very heart of Downtown Denver. This magnificent hotel is home to more than 240 distinct and beautifully appointed guestrooms and suites, which feature refined decor and furnishings along with contemporary amenities such as plush terry robes, pure artesian water from the hotel's own well, and complimentary high-speed Internet. The hotel also boasts six outstanding restaurants and stylish bars, an exclusive boutique spa and wellness center, more than 20,000 square feet of function and meeting space for special events, and unrivaled hospitality and service. 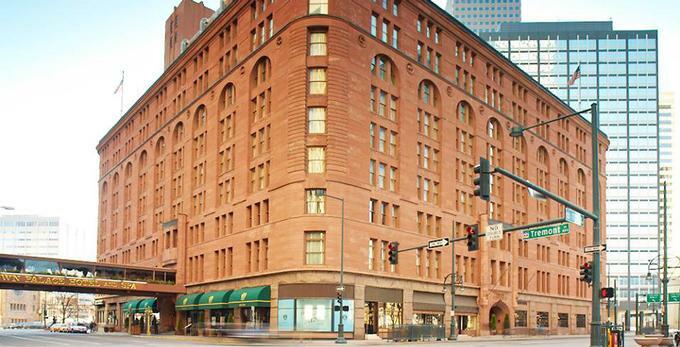 The Brown Palace Hotel and Spa is situated in the heart of Denver and conveniently located for exploring all that the city has to offer. The hotel is within distance from the Colorado Convention Center and the famous Coors Field, as well as several museums, galleries, attractions, restaurants and excellent shopping. The Brown Palace Hotel and Spa offers a range of elegant and stylish accommodations for every taste. Seamlessly blending the grace of a bygone era with modern day functionality, guestrooms and suites range from traditionalClassic Queen Rooms to chic and luxurious Signature Rooms. Classic Queen rooms feature beautiful marble entrance halls, queen-size beds dressed in luxurious linens, private bathrooms with rain showers, soaking tubs, plush spa robes, and modern amenities, including flat-screen HDTVs, iPod docking stations, Keurig coffee makers, and complimentary wireless Internet. Spacious and sophisticated, Signature Rooms boast one king or two queen-size beds with luxurious bedding and linens, antique wood armoires and spacious walk-in closets. Private en-suite bathrooms feature deluxe corner glass showers with rain shower heads, double marble sinks, and lighted makeup mirrors and modern amenities include flat-screen HDTVs, iPod docking stations, Keurig coffee makers and complimentary wireless Internet. Modern design meetsstylish sophistication in the Executive King Rooms, which epitomize the height of luxury. Ample king-size beds are dressed in luxurious linens, private en-suite bathrooms enjoy walk-in showers with rain shower heads and soaking bathtubs, and modern amenities include flat-screen HDTVs, iPod docking stations, Keurig coffee makers and complimentary wireless Internet. The Brown Palace is home to some of the city's most celebrated restaurants and bars. Boasting no less than four elegant restaurants and two bars, as well as an excellent in-room dining menu, both guests staying at the hotel and non-resident visitors can enjoy a variety of dining experiences from intimate fine dining dinners to casual, family-friendly affairs. Renowned for serving the best prime rib in in Denver, Ship Tavern is a casual, pub-style restaurant with a vibrant atmosphere that serves a menu of all-American fare such as hearty burgers, prime steak, fresh seafood and an extensive selection ofmicro-brewed beer and wines from around the world. Ship Tavern is a great place to watch the latest sports events on big screen televisions and offers live entertainment Wednesday through Saturday evenings. Ellyngton'sis known for being the hot spot for power breakfast and lunch, drawing both business and leisure crowd for its creative cuisine and attentive service. Tuck into hearty breakfasts of Brioche French Toast, Eggs Benedict, Lobster Scramble or Lemon Poppy Waffles, while lunches offer delights such as Strawberry Frisee Salad, Croque Madame, and steaming Crab Cakes. Rated as one of Denver's best fine dining experiences, the award-winning Palace Arms at The Brown serves an enticing menu of inventive and innovative cuisine, such as Colorado Braised Pork Cheeks and Spring Foraged Allium Soup. The cuisine is perfectly paired with excellent wine selections and desserts like Lemon PoppyseedCremeBrulee add the final touches to an unforgettable epicurean adventure. The Churchill is a sophisticated bar with a refined gentlemen's club ambiance and serves an extensive menu of single-malt scotches, vodkas, small-batch bourbons, and premium spirits and wines. Churchill also offers an excellent selection of over 60 cigars from a customized humidor, as well as a short menu of light meals for lunch and dinner. Sip signature cocktails and enjoy delicious light meals and snacks in the hotel's exquisite nine-story atrium, which boasts an inviting and inspiring setting. Begin the day with a freshly brewed cup of coffee from Coffee & Tea Co.Tucked in a quiet corner inside the main entrance of the hotel, this popular morning spot serves a selection of Allegro coffee and tea, and an array of freshly baked pastries and breakfast goods. The Brown Palace offers a variety of deluxe amenities in addition to the luxurious accommodations to create an unforgettable experience in every way. From the luxury and functionality of the beautifully appointed guestrooms and suites to the presentation of innovative and creative cuisine from no less than six restaurants and bars, The Brown exceeds every expectation. Exceptional services and amenities include an exclusive onsite spa and salon, and a fully equipped 24-hour fitness center with state-of-the-art equipment, ranging from cardiovascular equipment, treadmills and ellipticals to stationary bicycles and a free weights section. The hotel also boasts nearly 20,000 square feet of event space, including 18 meeting roomsfor business meetings, conferences and other functions, a social lobby where guests can gather, a complimentary car service to any destination within a five-mile radius of the hotel and free wireless Internet throughout the property. Housed in a quiet corner of the hotel, The Spa at The Brown Palace seamlessly blends the age of Victorian elegance with elements from the post-modern West with exclusive combinations such as a decadent Champagne brunch followed by an indulgent Swedish massage or a pampering body treatment before a traditional afternoon tea. The Spa at The Brown Palace features sixluxurious treatment rooms, including a separate hair salon, manicure and pedicure room, and private couples' VIP suite. The spa offers an array of spa and salon services that guarantee an indulgent and pampering experience, including custom spa treatments and special soaks with water drawn from the hotel's artesian well. The spa menu features a range of rejuvenating massages, body scrubs and other treatments, facials and skin care, nail care and a full salon for hair care and treatments and clients can enjoy complimentary valet parking when visiting the spa. The Brown Palace Hotel & Spa pairs modern meeting facilities with timeless luxury to offer unique venues and spaces for business meetings, conferences, and private functions. The hotel boasts over 25,000 square feet of modern meeting and event space, along with state-of-the-art technology and complimentary wireless Internet to cater for all needs. The 5280 Suite is a dynamic, flexible space with the ability for multiple setups that can be configured for a variety of functions, while the elegant Grand Ballroom is ideal for weddings, balls, and other special occasions. Named after previous owners of The Brown Palace, The Boettcher Boardroomis tucked away on the eighth floor and conveniently adjoins to an executive one-bedroom suite if required. This beautiful room is flooded with natural light from vast windows and features a large cherrywood conference table and leather executive-style chairs for up to 14 delegates. The Brown Palace Club served as a private gentleman's only club until the 1980s before it was converted into an elegant meeting space that caters for special events and business functions. Located on the third floor of the hotel, the Coronet Room features large windows that light the room, a spacious area for boardroom tables and chairs, a wet bar and its own restroom. Once called The Wedgewood Room, the newly named Gold Roomis situated next door to the Onyx, and features rich walnut wall paneling and a beautiful gold sunburst wall clock that hangs above an ornate walnut and marble fireplace. Other meeting spaces and rooms include the Tabor Room and the Onyx Rooms, which cater for a variety of more intimate events and functions. The vibrant capital of Colorado, Denver is a bustling metropolis dating back to the bygone era of the Old West. The city's oldest block, Larimer Square is home to some magnificent landmark 19th-century buildings, and there is a fantastic range of museums, galleries, and attractions to enjoy, including the Denver Art Museum, and the mansion of famed Titanic survivor Molly Brown. Denver isalso at the center of some of the best skiing the Rocky Mountains have to offer and is a starting point for many of the trips to the surrounding resorts. Back to: Colorado Weekend Getaways and Best Things to Do in Denver.